Practice excellent customer service and meet your customers! Welcome to the Pack To School Backpacks for Kids charity team building event that guides your team in filling backpacks for kids with all the school supplies that kids need to succeed! From the creative mind of Quixote Consulting founder Rob Fletcher, our consultants have helped hundreds of companies just like yours help-served children around the world. Teams earn points by completing fun school-oriented challenges (that can be customized just for you!) to earn the essential ingredients to fill backpacks for kids that need them most. Teams solve fun, innovative puzzles and challenges to earn enough “money” to purchase that last crucial supply to be the first to fill their backpacks for the kids. The Pack To School Backpacks for Kids charity team building activity is an excellent way to reach out and help the children that aren’t as fortunate as we are by giving them the essential school tools they need to succeed. The backpacks for kids are filled with binders, crayons, pencil cases, notebooks, water bottles and more! And to add that special touch, each backpack for a kid is also filled with a lovely hand-written card from your team full of encouragement and love. And that’s not all – teams also build kits for recreation classes, medical kits, arts class, music class and more! And if location and timing permits, Quixote Consulting can coordinate a service project right in the school, painting and rebuilding in an extreme school makeover! With so many different ways to have fun and earn supplies for the backpacks for the kids, there’s something for everyone on every team to do. The group can only be successful by working together, communicating effectively, identifying strengths of team members, and focusing on their mission – helping the children. We partner with charities such as Boys and Girls Clubs to get backpacks to the kids and help the schools that need them the most. We’re also happy to partner with a local school or charity of your choice. All the school supplies any kid could need to succeed. Whatever other great ideas we come up with together! 1 – The Children: By focusing on the children as customers and having a tangible, memorable and direct experience with them. You’ll be amazed at how energizing the Pack To School Backpacks for Kids charity team building activity can be for everyone involved. You will also realize what your team can accomplish back at work after an event that has everyone working together for such a rewarding cause. We take care of all the logistics – making you look good while making the whole event simple and painless. Remember, keep this one a surprise for the participants – don’t spill the beans! The surprise value of the big finale cannot be overstated. Icebreaker with Purpose – Your event begins with a fun, fast-paced energizer that lets people learn something wonderful about other people on their team related to purpose and connecting back to when they were kids. Challenges with Purpose – Every challenge that teams complete to earn their bicycles tests and teaches the latest strengths, happiness and positive psychology research, particularly focusing on the power of purpose. We go beyond a random assortment of trivia to get your team valuable information in fun ways that stick. Or if you like, together we can customize the challenges to test and teach your team important and fun information about your company. Or we also have a just for fun set of challenges if fun is the highest order of the day. Customization – We can customize as much or as little of this event as you want – challenges, decorations, rules, even the game itself. If there’s a theme for your conference, convention or team project, let us know and we’ll make it happen. Content with Purpose – If you have the time, we’ll combine a mini-training session on the Power of Purpose before the Collaborative Pack To School Backpacks for Kids charity team building activity at no extra charge. This mini-session is perfect if you have three or four hours total. Resources After the Event – Participants will receive both the Power of Purpose e-book by team strengths expert Rob Fletcher (an excerpt from his forthcoming book At Your Best) and wonderful pictures of the event to keep the energy and momentum going. Complimentary Coaching After the Event – The leader of the team will receive one complimentary follow-up executive coaching session to assist in the learning transfer. Professional Development (Optional)– Combine the Collaborative Pack To School Backpacks for Kids charity team building activity with one of Quixote Consulting’s training programs such as the strengths-based program At Your Best or an assessment such as MBTI, Firo-B or StrengthsFinder for a full day of professional development that blends fun and content. 8-200The Pack To School Backpacks for Kids charity team building activity includes a debrief by a trained facilitator. The debrief focuses on linking the activity with your important work back at the office. The Pack To School Backpacks for Kids charity team building activity debrief helps you to leverage the power of purpose back at work, discover team and individual strengths and link your performance with contributing successfully as a team. Portions of the Pack To School Backpacks for Kids charity team building debrief can be customized for your group goals. 15 to more than 5,000 participants. 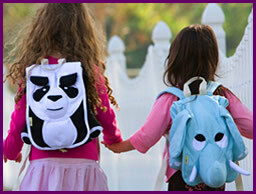 The larger the group, the more backpacks you make, and the more children in your community benefit! We've worked with very large and very small teams around the world. 20 square feet of open space per participant is a good guideline. The Pack To School Backpacks for Kids charity team building exercise can be indoors or outdoors – your office building, a ballroom or conference room, even a local park. The Pack To School Backpacks for Kids charity team building exercise can be held anywhere in the world. We come to you, complete with everything you’ll need to insure an exhilarating and memorable charity team building activity. We send action photos and further resources to participants after the event. These resources guide participants in making a strong link between their positive charity team building experience and their important work back at the office. Your group can also receive a large poster-sized Thank You card from the children, suitable for framing. We can also give you suggestions for a small gift for everyone who participates or fun extra gifts you can give to the children.